What splitting pattern in the 1H nmr spectrum would you expect for the hydrogen atom(s) colored red in the compound below? I think it should be a singlet since there is an electron withdrawing benzene ring, but apparently it is a doublet. Why? What causes splitting in an NMR spectrum? Due to the different magnetic field experienced by the proton? Basically most splitting is caused by the nuclear spins of two nearby protons perturbing each other. The presence of an aromatic ring doesn't grossly affect whether there is splitting or not. If two (symmetrically different) protons are within a few bonds of each other, they will split each other. For most aliphatic compounds, this is only relevant for protons that are attached to adjacent carbon nuclei. Aromatics can extend this a little, so you can get splitting between protons attached to carbon nuclei a little farther away. In the case of the compound you showed, 1-bromo-4-nitrobenzene. you have four protons attached to the benzene ring, but only two distinct types (protons related by symmetry don't split each other). 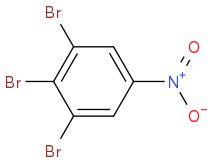 If we refer to the proton attached meta to the bromine position as HA and the proton attached ortho to the bromine position as HB, you get splitting between HA and HB (and identical splitting between HB and HA), giving you a doublet. Note that you do not get splitting between HA and HA or HB and HB. Here you have two protons, but they are symmetrically equivalent. They do not split each other and there are no other protons that can split with them. Therefore you would have a singlet. Here there are other protons in the methyl groups, but they are too "far" from the aromatic protons to have a practically observable splitting, so you still really only see a singlet in the aromatic region on the NMR spectrum.